NASA presented its first Ambassador of Exploration Award to former astronaut Gene Cernan, who commanded the Apollo 17 lunar landing mission, during a May 12, 2005 ceremony at the U.S. Naval Air Station in Pensacola, Fla. 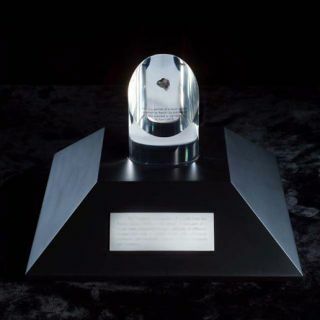 The award features a piece of moon rock and will remain on display at the National Museum of Naval Aviation. NASA will award Lt. Gen. Thomas P. Stafford with theAmbassador of Exploration Award at a ceremony attended by the astronaut'ssurviving Apollo- Soyuz Test Project Russian and American crewmates.The presentation will be hosted by the Stafford Air and Space Museum inWeatherford, Oklahoma on July 12. The award, which will feature a segment of moon rockrecovered during the Apollo 17 mission, will remain the property of NASA. Itwill be placed on public display at the Stafford museum, alongside theastronaut's Annapolis class ring and his Congressional Space Medal of Honor. Thomas Stafford flew on Gemini 6, the first rendezvousmission between two manned spacecraft, and Gemini 9; orbited the moon on Apollo10, and commanded the U.S. command module that docked in orbit with a Sovietcraft during the Apollo-Soyuz mission. Joining Stafford for the moon rock presentation will becosmonauts Alexei Leonov and Valery Kubasov of the Soyuz crew and Vance Brand,who flew aboard Apollo. Deke Slayton, the third American ASTP crew memberpassed away on July 12, 1993. The award ceremony will begin at 1 p.m. in Weatherford. As an Ambassador of Exploration, Stafford will help thespace agency convey the benefits of space exploration and work to inspirestudents to pursue careers in science, mathematics and engineering. The Ambassador of Exploration Award was announced last Julyduring the 35th anniversary celebration of the Apollo 11 lunar landing. Itrecognizes the sacrifices and dedication of the Apollo, Gemini and Mercuryveterans. Each astronaut or their surviving family will be presentedwith a lunar sample, part of the 842 pounds of moon rock and soil returnedduring the six moon landings from 1969 to 1972. CBS anchor Walter Cronkite isalso an honoree.